^^ Yes, share that wall. ^ I admire your desires to explore! ^ That is an excellent example of a great VSIDO desktop! that, and a nice choice of music. @vastone - gentoo/gentoo based distros are the only mainline disto that I've never completely installed (had a couple epic failures though) so it's now the current quest to get a gentoo system up and running. 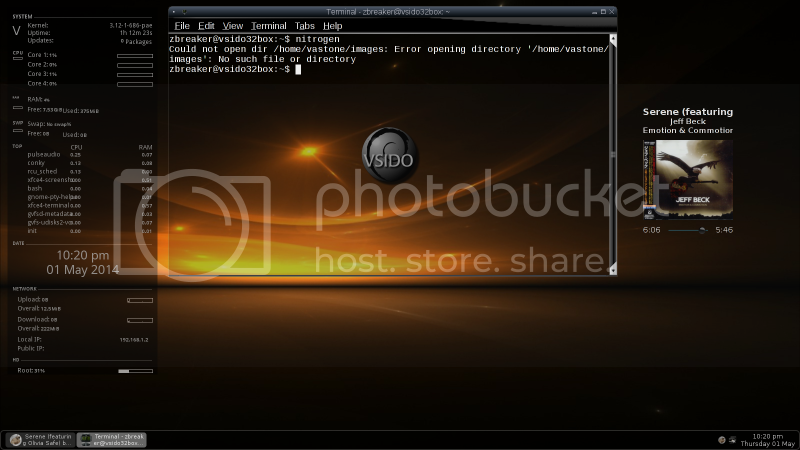 As a sidebar note to anyone with mad gimp skills; can that VSIDO orb logo in the terminal be made semi-transparent so it looks more like a watermark? Just have to figure out how to get a custom kernel to compile correctly (3 epic failures to date) on funtoo/gentoo and that will be it. Got everything else working the way I want. ^ Nice work Mr Rat Man! I am getting 3.14 ISO's ready as we speak... they will be out in an hour. Your server is already there, how do you like the 3.14 kernel? Unfortunately, the gentoo build script has failed twice on me - X doesn't work. Tried a manual configure and screwed the pooch on that one myself. The debian method I use always works - score one for debian. I'll have to plow through the gentoo wiki a bit more before trying again.